From clothing to books to media equipment, Office Chairs Unlimited Storage Cabinets offer the perfect solution for your storage needs. Storage cabinets with amazingly spacious shelves and plenty of hanging space are available in modern styles and in many sizes. These cabinets have adjustable shelves, steel reinforced bases, and core removable locks. 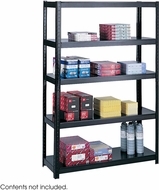 Mobile pedestal cabinets are available for storage and organization of files and documents. With Office Chairs Unlimited Storage Cabinets, there's a place for everything.